In the name of Father, Son, and Holy Spirit. Tonight begins the celebration of the Feast of the holy hierarch and wonderworker St. Nicholas. The Holy Orthodox Church commemorates him with special festivity, and his feast day is reckoned as one of the great feasts of the ecclesiastical year. As we have said before, St. Nicholas left behind no additions to the Church's sacred literature, to the sublime treasure-chest of the writings of the holy fathers of the Church. Let us recall St. John Chrysostom, let us bring to mind St. Basil the Great and St. Gregory the Theologian along with the rest of the mighty chorus of those giants of theological thought and word. 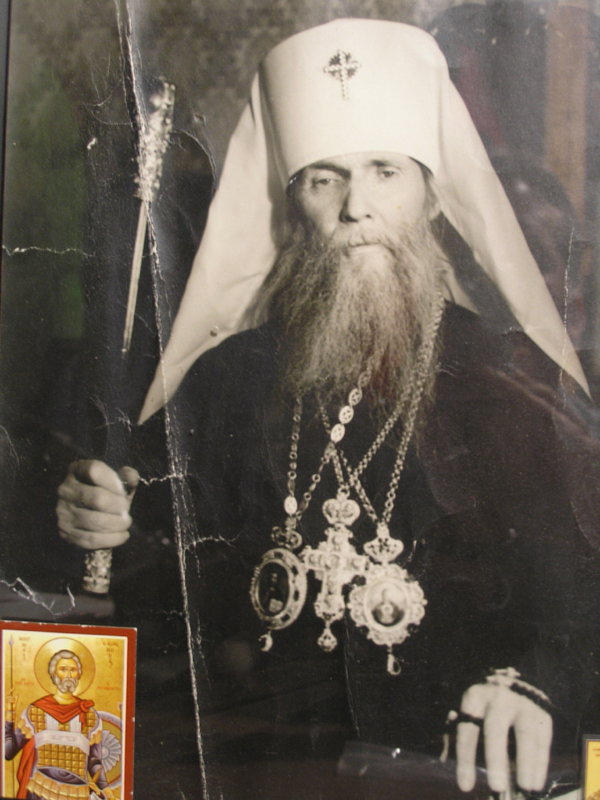 Each of these surrendered to us a tremendous treasure, and the Church celebrates their feast-days, glorifying them as the ecumenical teachers, as hierarchs who through their spiritual influence and authority crossed the borders of their own dioceses and became in fact bishops of the entire universe. Though the sacred services in their honor are very solemn and festive, still they do not exhibit the touching and jubilant character of the service to St. Nicholas, to him who is called among our Russian people "Nicholas the Merciful." In him, as perhaps in no other saint, are incorporated to an incomparable degree the wondrous virtues of love and compassion. This has moved the pious Russian people to say as a proverb: "Bring your tribulations to Nicholas the Merciful, and he will take them to the All-Merciful Savior." Yet it must be remembered that this love which illumined the heart of St. Nicholas for our Lord and his neighbor, this love, when confronted by stubborn evil and conscious enmity against he Truth was transfigured into burning and indignant zeal. Certainly many of you know of an event within the life of St. Nicholas which has been preserved in the Tradition of our Holy Church and which is even now depicted on many icons of the Wonderworker of Myra. As he sat at the sessions of the First Ecumenical Council, he listened to the blasphemies of the heresiarch Arius against which this Council had been summoned. Arius defended his doctrines stubbornly, and with bitterness directly assailed the divine dignity of the Son of God. It was just this that St. Nicholas could not abide, for the Savior of mankind was dearer to him than his own life . . . and St. Nicholas slapped the blasphemer in his face! Much was the confusion of the Fathers of the Council, for there is a Canon which calls for deposition of a clergyman who would strike anyone, whether a Christian or an unbeliever, and the Fathers took all the Canons seriously. But on the other hand, St. Nicholas was held in high esteem by the Fathers of the Council for his virtues shone with a heavenly brilliance for all men to see. So it was that he was placed in seclusion until the end of the Council when his case would be discussed also. But even this penalty was set aside by divine intervention; for, one of the Fathers there was granted a revelation: he saw our Lord giving the divine Nicholas the Book of the New Testament, and the All-holy Mother of God giving him his omophorion—the vestment symbolic of the episcopacy. The Father lost no time in relating this vision to the other Fathers who speedily reinstated St. Nicholas with honors to his rightful place among them. In such a clear way did our Lord reveal that St. Nicholas' act was not a petty outburst of human anger or malice, but that it was rather just wrath against the blasphemies of a heretic. Such a man was St. Nicholas! Oh, how lacking we are in such zeal to defend Truth when it is trampled and insulted. Just recently I was told of a matter which occurred of late, such as we would never have imagined just a few years ago; but it just shows us how deeply we have sunk. This gentleman, who is from Pairs, told us of an "Ecumenical" meeting held there. You of course know what "Ecumenism" is: it is just that heresy of all heresies! It seeks to completely destroy the fact that the Orthodox Church is the unique guardian of the Truth, and in Her place to create some new sort of strange organization encompassing all sorts of beliefs. And so, alas, to this ecumenical meeting there went an Orthodox priest from the Paris Theological Institute . . . a heretical institution itself. In attendance also there were a Latin priest, a pastor and a rabbi. There was some sort of common prayer, and then there began lectures. And then . . . (please forgive me for even saying such things from this sacred ambo, but I want you to know how far things have gone) the rabbi asserted that our Lord Jesus Christ was the illegitimate son of a woman of frivolous behaviour! His actual word was coarser and even worse, but I cannot quote from this sacred tribune the words that this insane detractor used against Her Who is more honorable than the Cherubim and incomparably more glorious than the Seraphim. Yet even this is not the worse thing, for the Jews have long been in opposition to God, and their detractions against our Savior and His Blameless Mother are nothing new; no, the worst thing is that when he said this, ALL kept silent! The "orthodox" priest who heard this blasphemy was later asked how could he have kept quiet. And he answered: "I didn't want to offend the Jew." One may not offend a Jew, you see, but to offend the All-pure Mother of God; this is permitted! How deeply we have fallen! How lacking are we in zeal! This priest should have raised himself up to full stature to stop the mouth of the blasphemer as did St. Nicholas. St. John Chrysostom preached: "If you are afraid to confront a heretic, tell me and I shall go to stop his mouth." But we, alas, have become "shamefully indifferent to both good and evil" as the poet has written. And from this indifference and this self-care does "Ecumenism" reap the fruits of apostasy which are becoming more and more clear. We fail to heed the lesson taught us by St. Nicholas of how we must defend the glory of our Lord God when sacred things are blasphemed and His Name is trodden upon. Let us remember that Christian love embraces all men; it manifests mercy to everyone and warmly prays that all be saved. But when this love witnesses a willful campaign against Truth, then it burns with a consuming zeal which will not permit such assaults. The example of our holy father St. Nicholas is a shining example of such love, the love which must burn in every Christian heart for our Lord God. Amen.